It was my birthday on Monday, and both my boyfriend and I took the day off work. Did we take advantage of this by going out raving on Sunday night, spending my birthday hungover on the sofa? A birthday is a day for doing your favourite things. So, we went for a Nordic run along the Thames together. The sky was clear and the wind that had been gathering near home died down by the waterside. We just did 4 miles, but quickly, so my lungs were pumping full of chilled air by the time we finished. Our cool down walk must have looked very funny. Pink-cheeked, still in our running gear, wandering round the supermarket buying the ingredients for my Birthday Chelsea Buns. My next favourite thing – food! 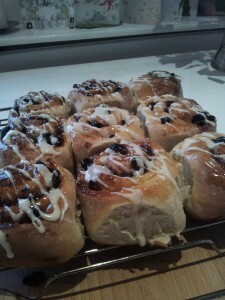 These buns are made of enriched bread dough with a heap of dried fruit inside. If I were going to stay in a hotel the night before a race, I’d make some of these the day before to aid my carb-loading. All-told, they take about 2 and a half hours to make and are best eaten on the day of making, so they do need a leisurely (birthday?) day off to make, really. You could always start them on a weekend morning and go for a 50-minute run during the first proving, rather than just opening presents like I did. Make sure that you buy dried fruit that is free of sulphur dioxide – your gut will thank you for it. These buns are based on Paul Hollywood’s recipe from the Great British Bakeoff Book. 1. Sift the flour and salt into a large mixing bowl and make a well in the middle, and pour in the sachet of yeast. Heat the milk and butter in a saucepan. When the butter is melted and the milk is warmed through, pour into the well and stir thoroughly with a wooden spoon. Your dough will seem very wet – if it’s overly so, add a little extra flour. 2. Pull the dough into a ball and pop onto a lightly floured surface. Knead it for 5 minutes. The kneading will stretch the gluten in your strong flour out, making it both extendable and elastic. The dough should feel very smooth and springy after 5 minutes. 3. Wash out your original mixing bowl, then pour in a little vegetable oil. Pop the dough back in the bowl; turn it all over so it’s lightly greased all over. Cover with clingfilm and a clean tea-towel. Leave in a warm place for one hour. 4. Your dough will now have doubled in size. Put it back on a lightly floured work surface and roll out into a rectangle approx 40cm wide and 0.5mm thick. (I freaked out at this point that we’d only been given two dimensions in our recipe, but the third dimension takes care of itself if you’ve got those two right). 5. Mix your sugar, cinnamon, zest and dried fruit in a bowl and sprinkle liberally all over your dough, from edge to edge. Press the long side closest to yourself into the worktop to stick it down, so you can get a tighter seal. 6. Roll the dough from the far edge, tucking as tight as you can. Imagine that stupid tiny bag that you have to get your sleeping bag into. Tuck like that, pulling and tucking on each roll until you’ve rolled the whole thing. 7. 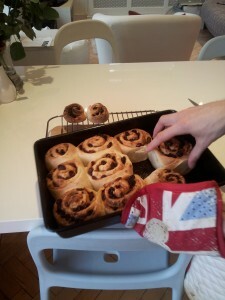 Cut into about 10, 4cm wide, buns with a sharp knife. Mine turned into 9 and 2 strange end pieces. Put these, cut side up, into a greased baking tray with a little space in between them, Put your cleam tea towel over again and leave to prove for 30 minutes. Preheat your oven to 190C/375F/Gas 5. 8. When they’re all puffy and maybe even touching, it’s time to bake. They should take 20-25 minutes, but start peeping in the door of your (closed!!) oven from about 16, like one of the crazies from bake-off. Cover them with foil if they’re getting a bit too brown. 9. Remove them from the oven and pop on a wire rack to cool a bit. Melt the apricot jam in a pan on the stove and brush them all over with this. 10. When they’re completely cool, mix the icing sugar with 1 ½ tablespoons of water and the zests of orange and clementine. Drizzle the icing all over the buns. Gobble the same day. Due to the low fat content in comparison to croissants or other such pastries these Chelsea buns will only keep fresh for a day or so before going stale. Good excuse to eat them all up quick! If not they will make fab bread and butter pudding.